While Android makers like LG, Motorola, and ASUS, are working on their second-gen smartwatches, Huawei is finally getting around to the first. Previously announced back in Barcelona this spring, the Huawei Watch is finally ready to conquer wrists. And it’s a good start—with room for improvement. 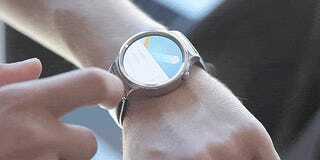 Smartwatches have a pretty different design direction from smartphones right now. Where companies are tinkering with how to make the best phone possible for the very least, like the new Moto X or the OnePlus 2, smartwatches are generally aiming for pricier and more luxurious. Manufacturers are slapping plated gold and machined silver onto watch cases to make your wearable more formal. Apple has its $10,000 beauties and Android Wear will soon have a few luxury options from Tag Heuer and others. Huawei Watch is gunning for that latter category—not ludicrously expensive but not exactly walking around money either. Ranging from $350 to $800 (see the gold one below), Huawei wants to be the more high-end option for Android Wear, and these watches do look the part. However, we’re still going to give the Huawei Watch the same diagnosis as back in March—It’s too bulky. Just look at it! In a vacuum of comparison, it may not look so bad. So I took off my very dumb Komono watch and put it next to the Huawei Watch to help get a sense of just how ginormous this thing is. The title of the book is unintentionally poignant. Compared to the 10.5mm Pebble Steel, the 9.7mm LG G Watch R, or the really thin 7.9mm ASUS ZenWatch, the 11.3mm Huawei Watch is chunky, and you’ll feel it since on a smartwatch a difference of millimeters actually matters. But at least it doesn’t fall victim to the Moto 360’s “flat tire” screen design. You get a full circle here. As for the rest of the specs, it pretty much falls inline with everything else out there—Snapdragon 400 processor, 300mAh battery, 286 pixel-per-inch AMOLED display (behind fancy scratch-resistant sapphire glass), and of course, running Android Wear 1.3. It will also be available for all you iPhone users per Android Wear’s latest announcement. As for battery, the notorious pain point for most wearables, Huawei is saying the Watch will last up to 2 days, which is spectacularly vague. It does say that the Watch has a quick charge capability so you can go from zero to 80 percent battery life in just 45 minutes. As for when you can get the thing, pre-orders start today at Best Buy, Amazon, Google Store and GetHuawei.com. Watches will start shipping on September 17. The Huawei Watch is one of the better-looking Android watches out there, but the looks do not hide the tech-bloated bulk nor justify its more outlandish price. But if you don’t mind the bigness, are digging Huawei’s design choice (to each their own), and want a little Android Wear tech bling, Huawei has what you’re looking for. I just have a feeling that the person I’m describing is few and far between.